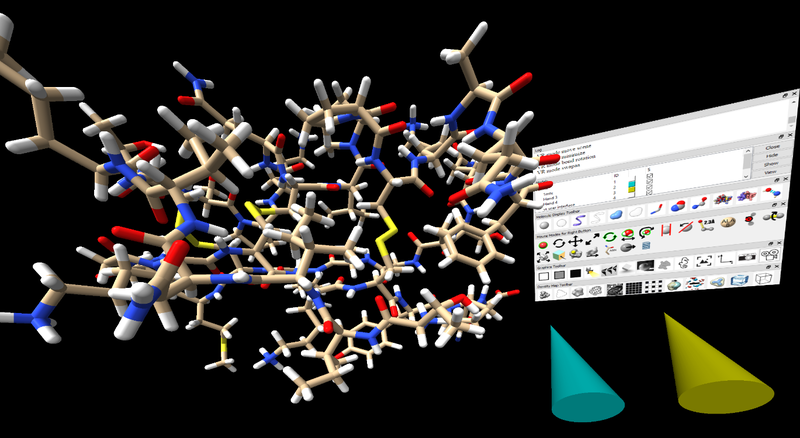 Here are step-by-step instructions for using ChimeraX virtual reality (VR) capabilities to mutate a residue, rotate a bond, and repack the new residue and neighboring residue using interactive molecular dynamics. More details about VR capabilities can be found in the ChimeraX manual and more VR examples are available. This demonstration requires a virtual reality headset that works with SteamVR such as the HTC Vive, Oculus Rift or any Windows Mixed Reality headset. Install Steam and SteamVR and check that your headset works. 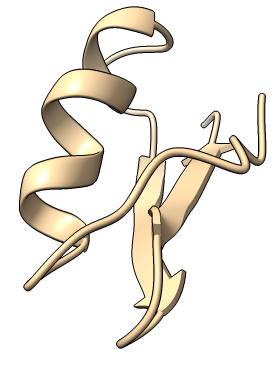 We will look at mutations of a scorpion toxin, PDB 1mtx. This toxin paralyzes victims by stopping electrical signals in the nervous system through an interaction with neuron ion channels. Mutations of the toxin can selectively disable different ion channels making this toxin a useful tool for researchers to understand the role of the different channels in neuron signaling. You won't be able to see these instructions once you have the VR headset on. All of the steps work the same using a conventional desktop display with a mouse. So it will help to do all the steps on a conventional with mouse (excluding VR-specific steps 4-6) to familiarize your self with ChimeraX, then do it with the VR headset. Install ChimeraX. It is free and runs on Windows, Mac and Linux operating systems. Start ChimeraX and StreamVR. Start the SteamVR runtime that allows ChimeraX to communicate with your VR headset. Open scorpion toxin atomic model using the following ChimeraX command. This PDB entry 1mtx is an NMR ensemble of 23 models and the "maxModels 1" option says to just open 1 model. Start VR mode with the following ChimeraX command. Move molecule. Press the index finger trigger button on either hand controller and move or rotate the hand controller to move the molecule. Scale molecule. 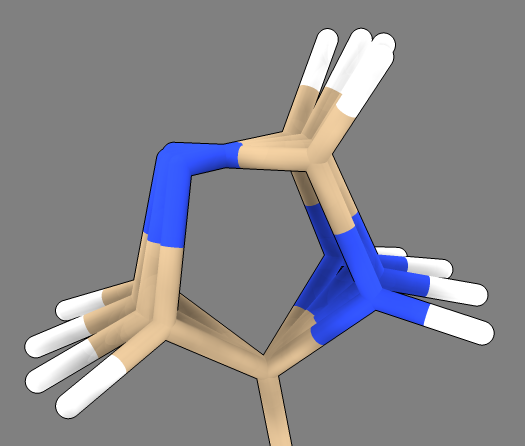 Press the index finger trigger button on both hand controllers and move the hand controllers apart to make the molecule bigger. Show VR user interface panel. Press the application button on the hand controller to show the ChimeraX user interface in VR. This button is in different locations on different hand controllers so try all the buttons until you find the right one. Move user interface panel. Press and hold the application button on the hand controller to move the user interface panel. Show atoms. 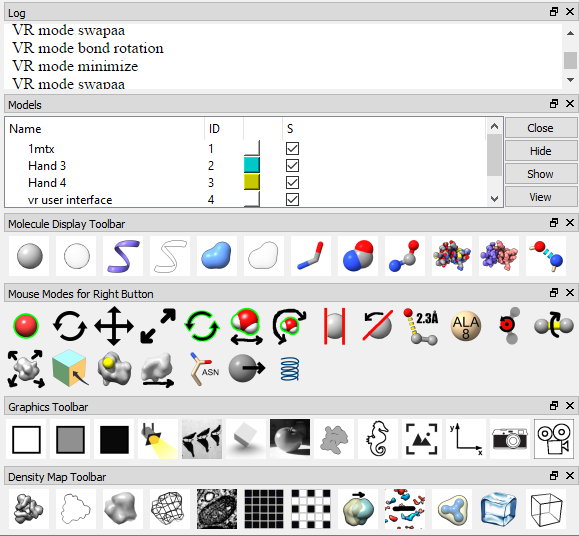 Click the show atoms icon (sphere) in the panel placing the tip of the hand controller over the icon and clicking the index finger trigger button. Hide ribbon. Click the hide ribbon icon (S outlie) in the user interface panel. 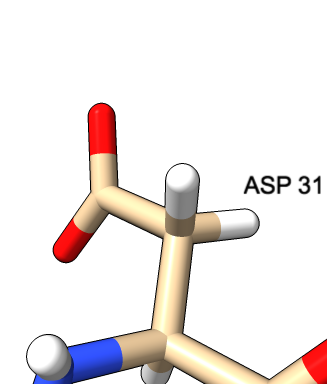 Click on the swap amino acid mouse mode icon with the hand-controller. The log area at the top of the panel will say "VR mode swapaa". 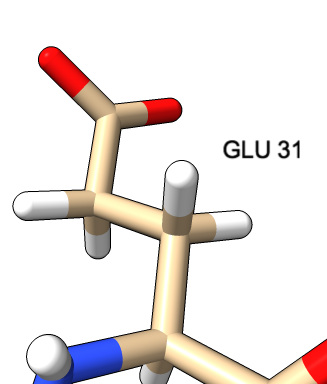 Now click on any atom and holding the button down move the controller up or down and the amino acid will switch between the 20 standard amino acids. Release the button to choose one. Working with the mouse you click the right mouse button, or hold Command key on Mac to emulate the right mouse button. Rotate a bond. To rotate a bond of the new side chain to avoid clashes with neighboring residues click on the rotate bond icon with the hand-controller. The log area at the top of the panel will say "VR mode bond rotation". Then click on a bond and rotate the hand-controller to rotate the atoms on one side of the bond. Repack residues. To minimize energy of the new residue click on the minimize energy icon with the hand-controller. The log area at the top of the panel will say "VR mode minimize". Then click on an atom of the mutated residue and hold the button down to run molecular dynamics on that residue and the contacting residues (within 3 Angstroms). Tug on atoms. To tug on atoms click on the tug icon with the hand-controller. The log area at the top of the panel will say "VR mode tug". Then click on any atom and move the hand controller while holding the button down to exert a force on that atom while running molecular dynamics. Small proteins. 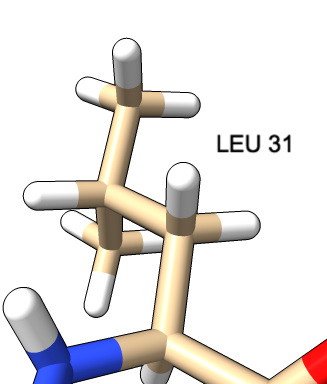 We have chosen a very small protein because currently the molecular dynamics residue repacking we want to demonstrate runs on the entire protein and is too slow on larger proteins. In the future this will be optimized to only run molecular dynamics on a part of the protein. If you wish to try another molecule, it will need hydrogens which can be added with the addh command. Currently only the standard 20 amino acids can be parameterized by our OpenMM molecular dynamics code. Flickering. Minimizing energy or tugging on atoms causes the graphics to flicker because it is not updated fast enough. To avoid nausea it is best to look in a fixed direction while doing these operations. In the future we plan to run the graphics and molecular dynamics in parallel to avoid this problem.